Blue September, the international campaign which encourages men to face up to cancer, launches in England and Wales today with the support of a wide range of sportsmen, celebrities, and politicians as well as health and sports organisations. Blue September is needed because the Men’s Health Forum’s statistical analysis shows that men in the UK are about 40% more likely than women to die of cancer. They are about 60% more likely to develop one of the cancers that affects both men and women, such as lung or bowel cancer. Men are also about 70% more likely to die from one of these cancers. Overall, 154,000 men a year are diagnosed with cancer in the UK and 81,000 die. Blue September supports the Men’s Health Forum charity and is the first campaign to increase men’s awareness of all cancers in England and Wales and the lifestyle choices men can make to reduce their risk. Blue September also encourages men to seek medical advice as soon as possible if they have a worrying symptom. 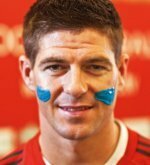 There's more on the ther big names from sport, health and television backing Blue September on malehealth.co.uk. Throughout September, there will be Blue September events taking place at football and rugby grounds, workplaces, hospitals and other venues across England and Wales. More information about Blue September and the people and organisations backing it can be found at www.blueseptember.org.uk.